Capsule Summary: Colonel Potter refuses to take it easy when his phlebitis acts up while a hotshot young surgeon shows up Charles. I appreciate the way the two primary storylines compliment one another, with Colonel Potter feeling unneeded and Charles worrying he’s being overshadowed, but it’s just not a very compelling episode. Captain Simmons is a bland character who serves only to move the plot along. Perhaps it was intentional: minimize Simmons and downplay his abilities rather than depict him as a genius surgeon the likes of which the 4077th has never seen. He’s clearly competent and more than holds his own during his first experience with meatball surgery but that’s it. It’s not like he saved a patient that Hawkeye or B.J. or Charles or Potter were going to lose. So why does Charles spiral drastically out of control, getting drunk three nights in a row? Simmons didn’t intimidate or bother Hawkeye or B.J. His presence simply reminded them to keep up on the latest medical techniques. Potter feeling that nobody needs him makes somewhat more sense only because Radar went to such lengths to tell him how easily he can be replaced by Simmons and how the 4077th doesn’t really need him for anything. Yet nobody ever mentions the fact that Radar was the one who sent Potter into a depression. Hawkeye and B.J. take a backseat to Potter and Charles, offering support to the former and sarcasm to the latter. They do seem to be genuinely trying to help Charles recover from his latest hangover, however. That likely has less to do with any feelings of friendship towards Charles and more to do with worry that wounded could arrive at any time. Which is exactly what happens. Although neither want to be in surgery, Charles and Potter manage to goad one another into performing well at the operating table. Charles makes a rare overture to Potter, admitting that the two may be equally talented with the scalpel, only to be shut down by Potter. Klinger’s C story is silly yet impressive. 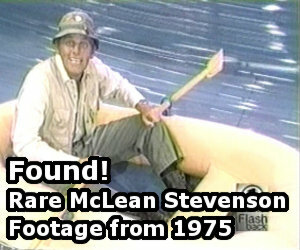 How much time and money did he spend shipping all those props and clothing over from Toledo? It’s unlikely he managed to have a personalized bowling shirt put together in Korea. He never broke character but he still did his duty, never putting patients in danger. Of course, the very fact he helped carry wounded soldiers and brought x-rays into surgery proved he wasn’t insane. Had he refused to do any work he likely would’ve been brought up charges. I wonder, though, what Colonel Potter would’ve done had Klinger not blurted out his rank while the Section 8 paperwork was being filled out. Colonel Potter: “I’ll go wherever I darn well please. It doesn’t hurt. Charles didn’t realize he was talking about himself. Margaret volunteering to talk to Colonel Potter is clearly an attempt to fit her into the episode but it works. Hawkeye just as easily could’ve been the one to try to get Potter out of bed. He would have been the obvious choice. I wonder what B.J. would’ve said to Potter had he been the one to go instead of Margaret. 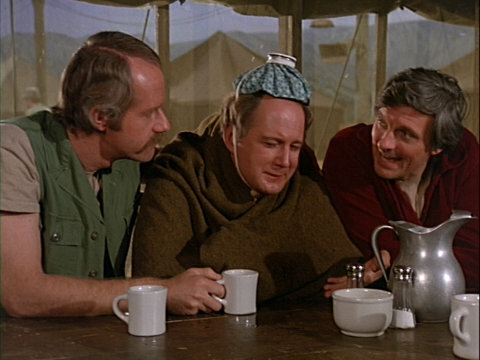 This was James Canning’s second and last guest appearance on M*A*S*H. He previously played Corporal Marsh in “Excorcism” during Season 5. While I agree that Simmons was otherwise a bland character aside from his brilliance and intelligence, I overall find this to be a good, solid episode. Radar: I’m sorry to interrupt your feeling better, sir, but there’s a Mr. Klinger here to see you. Col. Potter: Thank you, son. Send it in. LOL. The entire sequence is just too danged funny. Anyone know what book Potter is reading in convolescence scene?